I am happy to announce our new Karen Kay Buckley's Perfect Curved Scissors have arrived. What is the benefit of the curved tip you might ask? The benefit is that it allows you to clip close to your fabric without cutting into your quilt top. 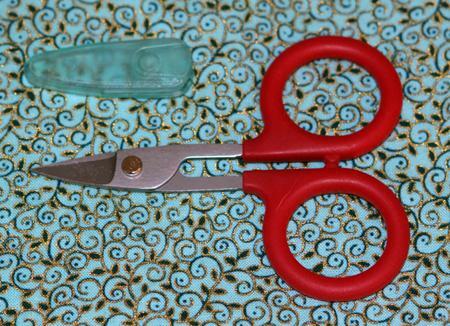 These scissors are fabulous for clipping threads for machine quilting, machine applique and machine embroidery. They have a serrated blade, a very comfortable handle, just like all of our other scissors and a right or left hander can use them with ease.